Can these glasses be personalized? BEST ANSWER: Hello Susan, we do offer custom personalization depending on what you were looking to have printed and what item you are looking to have personalized. Please reach out at 800-356-8466 and our sales department will be able to assist you with any custom personalization needs. Thank you! I have owned Riedel glasses for a long time and continue to replace broken ones with the same style. They are a great value for the money. Not usually a white wine drinker, I bought these glasses for the few friends that do drink white wine. I have been impressed with the design of Reidel and its uniqueness for each varietal, and these glasses are no exception. Glasses complement any wine at anytime. The glasses are rated 4 stars because they break too easily in the bowl. My wife uses the glasses because she is the white wine drinker in the house. She likes the look of the glasses. There is not a thing that she dislikes about the wine glasses. We love & have supported Riedel for 2 decades. We have used all of their stemware-lines through business & personal use & have always come back to the Vinum (including Extreme) series for our day-to-day use stems. Hands down the most effective for aromatics and visual but also true elegance for the price point. We use only Riedel glasses for our wine. Although we do have Sommelier glasses for other varietals, these Vinum glasses serve us very well for both chardonnay and sauvignon blanc. The fact that they are dishwasher safe is no small thing when having a larger group over to our home in the months when we entertain outdoors. I purchased these glasses to use for dinner parties where white wine was part of the menu. 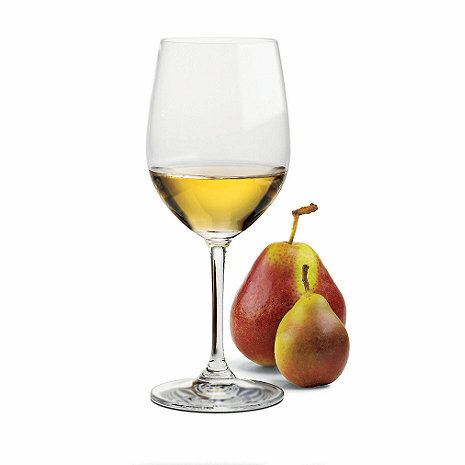 They are attractive, light, and with their slight tulip shape handle a variety of dry white wines. Good wine is better in the proper glass and Riedel's classic design and superior quality is evident in the Vinum line. We have used this particular line of stemware for many years. The only wine glass you need! Prompt delivery in good condition. Are there any other glasses to use? I can see why Riedel wine glasses are the standard! The Vinum collection is very affordable, though not easy to maintain, and they're surely worth it. I love the thin glass, but the drawback is that if you knock it over, it breaks (I've broken 2). But at [$] a glass, it won't break the bank. Very nice but be careful. Looks great, drinks great but very fragile. One glass from a previous set broke in the dishwasher. So only handwashing now which still caused an accident. A glass from the last set I bought shattered in my hands as I was washing it....carefully. Maybe a rinse in hot water is the only safe way. Great glasses but a little too delicate. Other Vinum glasses in the series don't break as easily but these seem to get chipped or break if you look at them the wrong way. A little too fragile for me - I only keep reordering to keep a matched set.